If you leave Wenatchee and head into Canada, roughly following the course of the big river, after 7 hours of driving you enter a town that might be called ‘Wenatchee North.’ Like Wenatchee, the town sits on the Columbia River and is cradled by mountains. And like Wenatchee it has a ski hill that is little more than a stone’s throw from downtown. Beyond this, however, the similarities begin to falter. Wenatchee North is much smaller, with a population of about 7,000 residents, and it is bordered by bigger, more muscular mountains rising to over 8,000 feet. And unlike Wenatchee the town sees enough precipitation that moisture-loving trees like red-cedar and spruce grow in the surrounding forests. 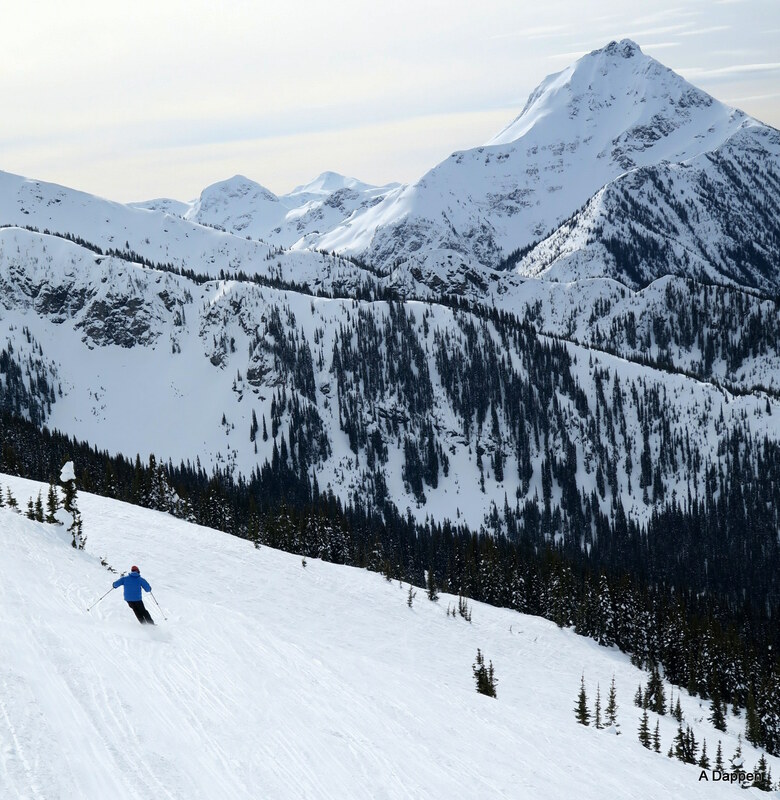 In fact, this combination of big mountains and big precipitation has allowed one of the premier destination ski resorts to sprout, along with the red-cedar, on the slopes a mere five miles from downtown. 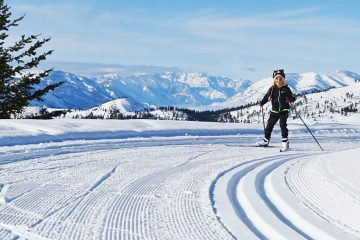 Besides great quality snow and great big mountain terrain, Wenatchee North boasts the greatest vertical relief of any ski hill in North America with thigh-destroying top-to-bottom runs of 5,600 vertical feet. Once sampled, a ski hill like this draws you back. This year it’s my daughter, Heather, who gets the ball rolling. She remembers the powder skiing we enjoyed five years ago, the lack of crowds, and the runs that seemed to last forever. She suggests we return for a repeat visit. When push comes to shove, however, Heather’s priorities are all askew and she can’t leave work for a several day road trip to a hallowed hill. “Get your priorities straight, will you?” I tell her, giving her sound fatherly advice. “Quit work.” Unfortunately she has inherited an inconvenient sense of responsibility from her mother and puts livelihood above lifestyle and decides to sit this visit out. I recruit Matt Dahlgreen to join me instead. Matt is an ideal ski partner because where you’re willing to lead he’s willing to follow. The thing about Matt, however, is that he also comes with a set of peculiarities. First he grew up in Idaho and learned to ski there so the guy has a serious case of McCallitis. Secondly he spent his career working for the Forest Service as a forester/ecologist so he’s a hopeless Treeophile. On any trip with Matt you’re going to get an earful about his all-time favorite place to ski and his all-time favorite plant. When we arrive at Wenatchee North, Matt is immediately pleased. The town’s restaurants, motels, lodges, and shops are pleasingly devoid of strip malls, franchised shops, and billboards touting name-brand labels and businesses. “What a quaint town,” Matt says. “It reminds me of McCall back in the day.” Matt uses ‘back in the day’ frequently because the gentrified, resort town of McCall today is a world removed from the far more diverse, resource-and-recreation town of his youth. The next morning as two gondolas and one high-speed chair move us uphill faster than a mass transit train, Matt’s eyes are outgrowing his goggles. “Holy Schmidt, we’re a long way up,” he says looking back on the black thread of the Columbia River snaking through the valley more than a vertical mile below us. We reach the high point of the lift assist and spend a few minutes viewing the nearby 8,000-foot peaks and the background 10,000-foot peaks composing the Selkirk Range. These peaks are not only big, but some are ridiculously steep. You feel like if you spit off some of them, your contribution could freefall right into the Columbia. “This place almost makes McCall look flat,” Matt says seriously awed by the surrounding. We warm up on Devils Club a black cruising run that would make any person who knows anything about this thorny plant a little wary. The run is steep and just keeps plunging down the fall line. It goes on and on … and on. By the time we bottom out, our thighs are stinging from the exertion – just like someone scraped Devils Club across them. We particularly enjoy one top-to-bottom run that starts in Iron Glaiden, cuts into the Stihl Life Glades, and finishes in the Aspen Glades. The snow is soft, the spacing between the trees is nearly perfect throughout, and those trees just keep coming at us like the targets of a video game that just won’t end. We can barely stand when we glide to the lift at the bottom of the mountain. “Wow! Wasn’t that the most fun ski treeing ever,” Matt says when we collapse onto the seat of the gondola. We both rub our thighs as the lift rockets us back uphill. The morning gets spent on the front of the mountain but in the early afternoon it’s time to introduce Matt to the North Bowl. From the top of the Stoke Express, the resort’s highest chair, we remove skis and hike a little higher along Lemming Line. After five minutes of walking we find ourselves on the sheer eastern ridge of the bowl. Some of the entrances into the bowl are cliff jumps or narrow chutes that braver skiers will commit to straight lining down. For chickens who don’t like to fly, there is one weakness in the ridge providing an easy traverse into the heart of the bowl. It has been a week since it snowed and while hundreds of skiers have visited the bowl in the interlude, the partially carved powder is still soft. “I liked that!” Matt says when we stop on a bench where the wide bowl starts to funnel skiers into a draw. We’re still a long way from the lift and we ski a variety of bumped clearings, bumped glades, and bumped creek drainages before we finally intersect the cat track that makes a long, fast traverse to the bottom of the Ripper Chair. Photo: Ski-in, ski-out lodging at the base area. Many lodging options exist in the town of Revelstoke, 5 miles away. In 2007, expansion efforts pushed what had been a small community hill into the North American ski resort with the biggest vertical drop. 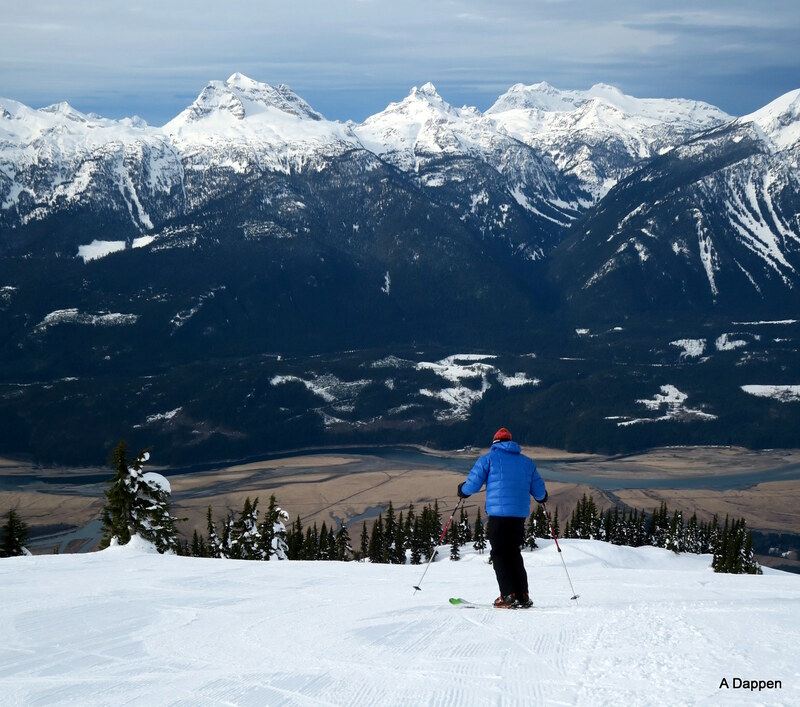 All the new terrain and the big drop moved Revelstoke from relative obscurity to the Who’s-Who list of Western skiing. Mountain Stats. Vertical feet of skiing: 5,620’. Skiable terrain: 3,121 acres. Terrain breakdown: 7 % beginner, 45.5% intermediate, 47.5% advanced. Number of named runs and glades: 65. Snowfall. Being new and not having decades of snow data to draw from, the resort lists its annual snowfall between 360 and 540 inches per year, which is as useful as a person saying they weigh between 150 and 225 pounds. 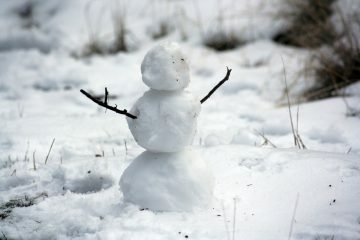 Nearby snow stations operated by Environment Canada, when compared to the known snow totals at the resort, would indicate the annual average of the resort to be 375 inches. Getting There. From Central Washington follow Highway 97 north across the border and then north to Vernon, BC. From Vernon, follow Highway 97A to Highway 1 near Sycamous and Highway 1 east to the town of Revelstoke. 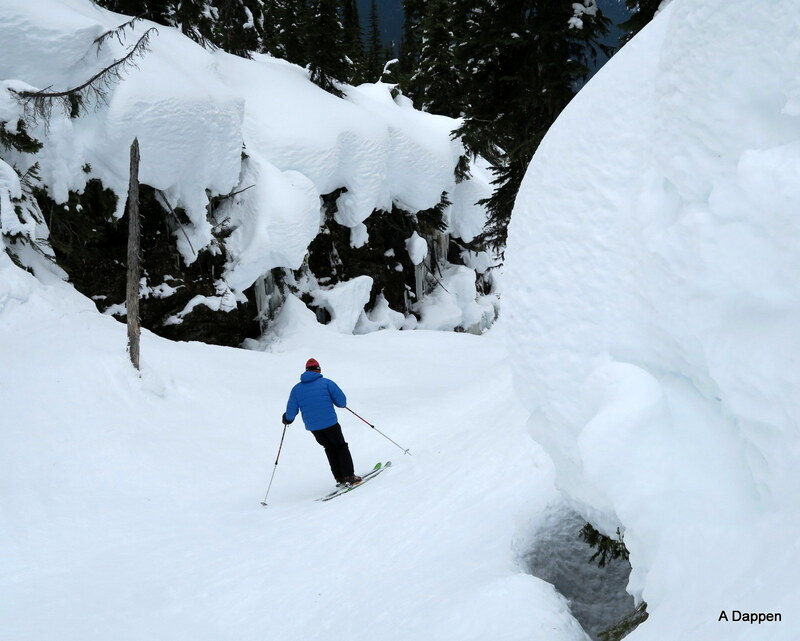 From Revelstoke, follow signs for five miles to Revelstoke Mountain Resort. Driving time from Wenatchee is 7 hours (nearly the same as reaching Mount Bachelor in Oregon and 2 hours less than driving to Sun Valley). Bring a passport for the border crossing. Lift Tickets. 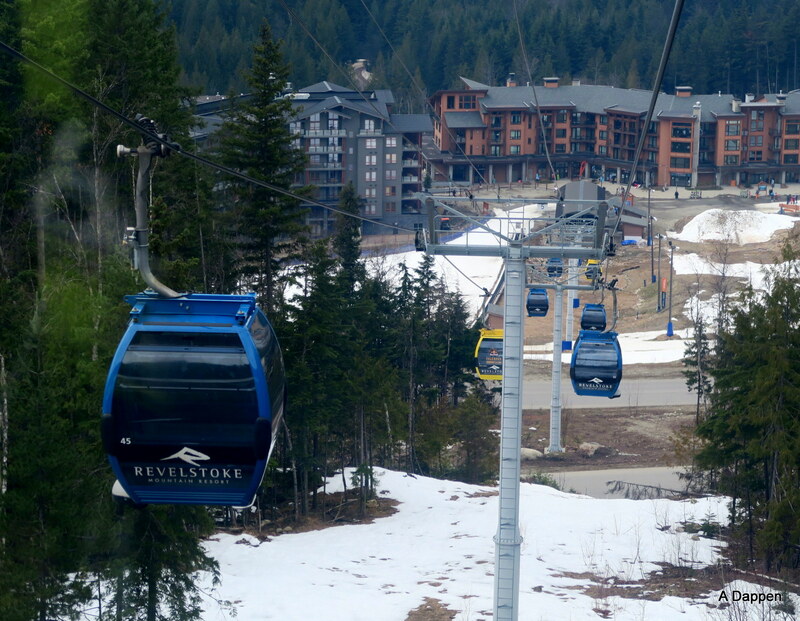 As of 2016, day tickets at Revelstoke Mountain cost $95 CND if purchased at the window. Discounted tickets available online. At the time of publication, one Canadian dollar is worth 75 cents US. Restaurants. Visitors can choose many manners of non-franchised restaurants on the mountain and in town. Trip Advisor directory and rating of eateries. Season and Hours. The mountain operates from late November through the first week of April. 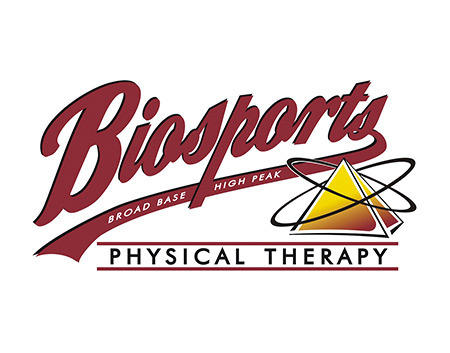 Daily hours of operation are 8:30 a.m. to 3:30 p.m.